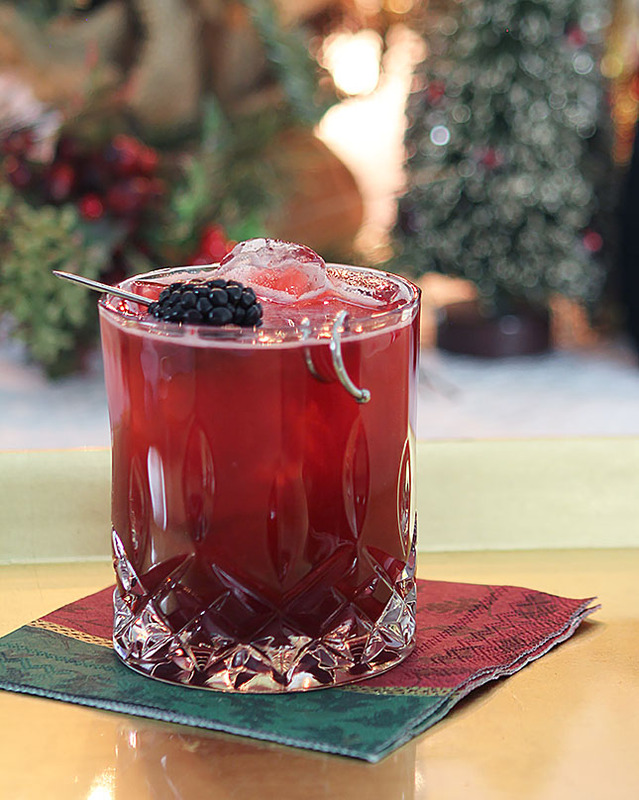 The Blackberry Collins Cocktail with St. Germain Liqueur is a beautiful and delicious cocktail I made for a holiday event but it’s equally at home in warm weather too; pretty much perfect all year long! When my birthday rolls around two weeks before Christmas, I have become accustomed to not making a big deal out of it. It’s smack dab in the middle of celebrating the biggest birthday of the year and as anyone born in December knows; good luck with yours mattering. Why I had a child on the 3rd of this month is beyond me; knowing what I know, I should have planned better! So when my friend Sandy asked me to meet her for Happy Hour; I was thrilled. She suggested a place near both of us that I had not been to before so we decided to meet at the Brick House Tavern and Tap. Why both Tavern and Tap? Isn’t that a bit redundant? OK, I digress, sorry. While I love my new house, my neighbors and my new neighborhood; I miss some things from my old homestead. I miss my yard. I wanted a smaller yard but did not realize just how close that would make neighbors…they are CLOSE. I miss my garden and yes, I can do that here but I’m sort of over the backbreaking labor part of gardening so I’m not looking as forward to that as I did 20 years ago. I might just put a hundred pots back there and call it good! I miss being 5 minutes from the grocery store too but I’ve learned to plan better and try to make a once weekly trip; no more quick runs to Sprouts for me. Five minutes was one thing, 15 is another. I don’t go into downtown Denver as much either; it’s gone from a half hour trip to taking an hour and I’ve got to be pretty motivated to go somewhere to incorporate a 2 hour round-trip drive into the equation and that’s if traffic cooperates. So, I need to further explore my new surroundings and this would be a good opportunity to check out a place I had never been. 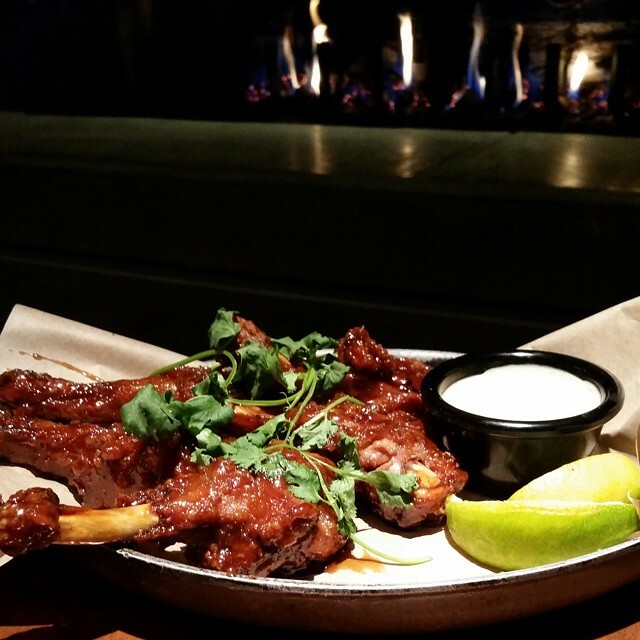 First; an absolutely terrific Happy Hour menu with real Happy Hour prices. Nice comfortable furnishings and a gorgeous fireplace we sat near to warm our tootsies. So far so good. The food sure did not disappoint; we ordered several dishes to share and each one was outstanding. Bleu & white chips were house made potato chips with bleu cheese crumbles and white queso. Crisp chips, sharp cheese and creamy queso. How could you not love that right? 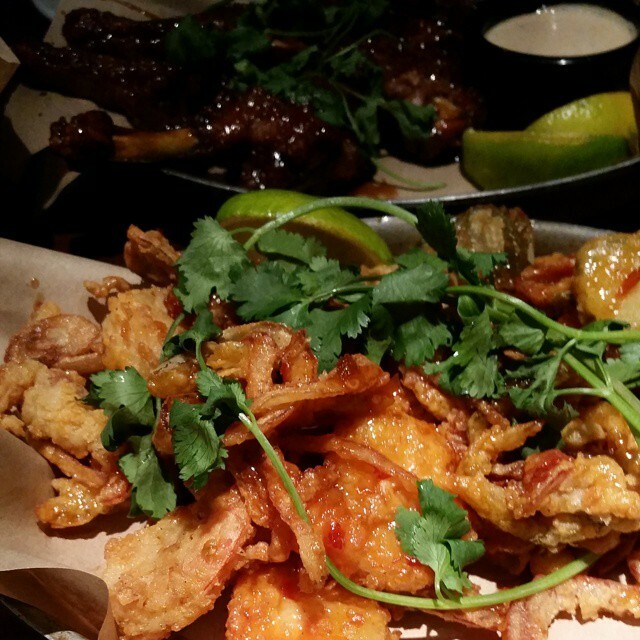 A terrific crispy, sweet and spicy shrimp dish (above) that was fantastic. Their calamari was hand breaded and tossed with cherry peppers and came with a side of basil marinara. As good as it was I found myself favoring that shrimp more and we considered ordering another plate of it. But then? The ‘oh my’ moment. The duck legs were something only previously of my dreams. Served crispy with what they called ‘man cave sauce’ (reminded me of a sweet teriyaki sauce), topped with fresh cilantro and a small pot of Sriracha Ranch dressing on the side. Probably a good thing they don’t deliver; I think I would have eaten these every night for the past week. Not purposely but interestingly enough I had done something that has been habit since I was a kid. I saved the best for last. So worth it. So want some more! It is a sports bar so on top of the many pluses there is the vast sea of television sets everywhere. It didn’t seem to jive; this idea of really great food in a place focused on people eating while watching TV. But to be fair I couldn’t complain…much better than being in a place supposedly focused on food and finding only quesadillas and potato skins right? It wasn’t that the television annoyed us (there was no big event on that night); more just an observation at how good the food was in a joint that catered to watching a game. Happy Hour cocktails are well drinks. We all know what that means. Bottom of the barrel liquors. No thanks; after all it IS my birthday. A quick perusal of the menu and a suggestion from our waiter and I chose the Blackberry Collins with St. Germain Liqueur. Sure looked pretty but I’m not that shallow; true love would be found in the substance of that first sip. Definitely fruity but I love what blackberries bring to a cocktail; all the pluses of having fruit without making them overly sweet. 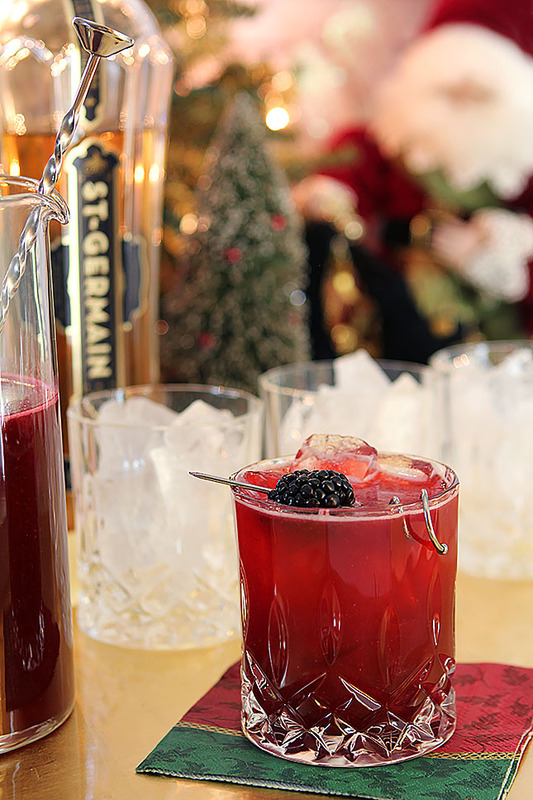 A lightly sweetened blackberry puree is combined with homemade sweet and sour mix, vodka, the magic of St. Germain liqueur and all are topped off with the fizz of club soda. St. Germain liqueur has been the darling of the cocktail (and bartender) set the past couple of years but it is worthy of any legend that precedes it for what it adds to a simple cocktail. I knew I would have to recreate this one at home. For me and for you. 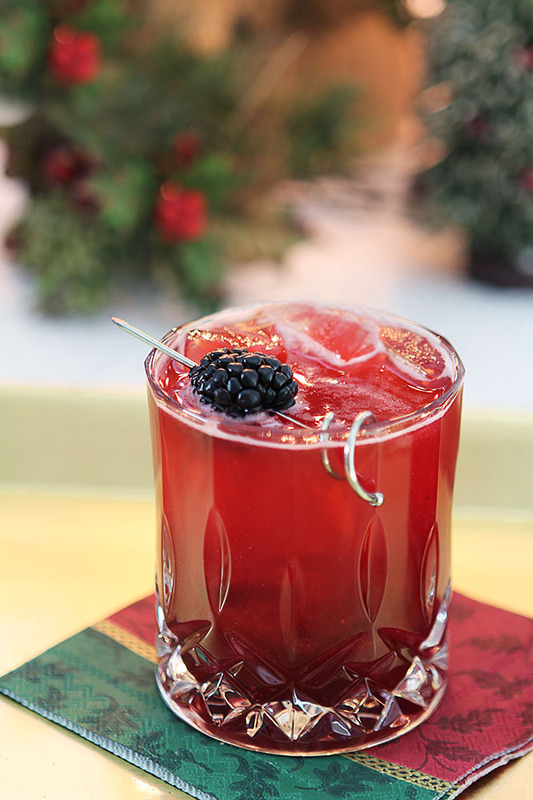 Needless to say, we simply loved this Blackberry Collins Cocktail with St. Germain Liqueur. It’s beautiful, tasty, and on the menu for a holiday party I’m hosting tomorrow night. It’s certainly perfect for that purpose but I’ll not limit this one to only a holiday cocktail; it would be equally great sipping on a warm summer evening; I know I’ll be doing that too! Mix the blackberry puree, sweet and sour mix, vodka and St. Germain in a cocktail shaker with ice and shake vigorously until cold. Pour over ice in a short cocktail glass; top with chilled club soda. Stir and garnish with a fresh blackberry. Combine water and sugar in large saucepan. Stir over medium heat until sugar dissolves. Bring to boil. Remove from heat and cool syrup. « Last Minute Fruitcake – So Easy. So Good. I looooove this cocktail – and no I haven’t even made it yet but I know from reading the ingredients I am going to love it!!!! So perfect for the holidays since it’s the ideal color and lower in alcohol! As a December B-day I know exactly what you mean – as does my husband who was born on Christmas!!!! I’m glad that you celebrated your birthday with a friend over a great meal and lovely cocktail in a new to you restaurant. When we moved out to the country we decided that we would try everyone restaurant in the little town closest to us. We don’t eat out very much at all but it is fun to go and experience a new place whenever we do. I love St Germaine – especially in a glass of bubble. Very celebratory! I know a lot of people with December birthdays, including Mrs KR (who just celebrated hers). Happy Birthday! This is a great drink to celebrate. I’m off for the rest of the year, so want to wish you Merry Christmas and a Happy New Years! I’m utterly swooning for this gorgeous cocktail! I’m currently at work at 9:45am and all I can think is that at 7pm when I leave here I’m stopping for some St. Germain to make this lovely drink. Stunning and sounds just divine. Now, if I could just make those awesome Bleu chips you were talking about appear I would be good to go. Yum! Oh and how could I NOT say a very happy happy birthday to you, Barb!!! I hope you thoroughly enjoyed it. Happy Birthday! You deserve the top shelf stuff on your birthday, everyone knows that. Your new place will have many things you like better than the old place. I’m glad you’re settled and happy this Christmas.